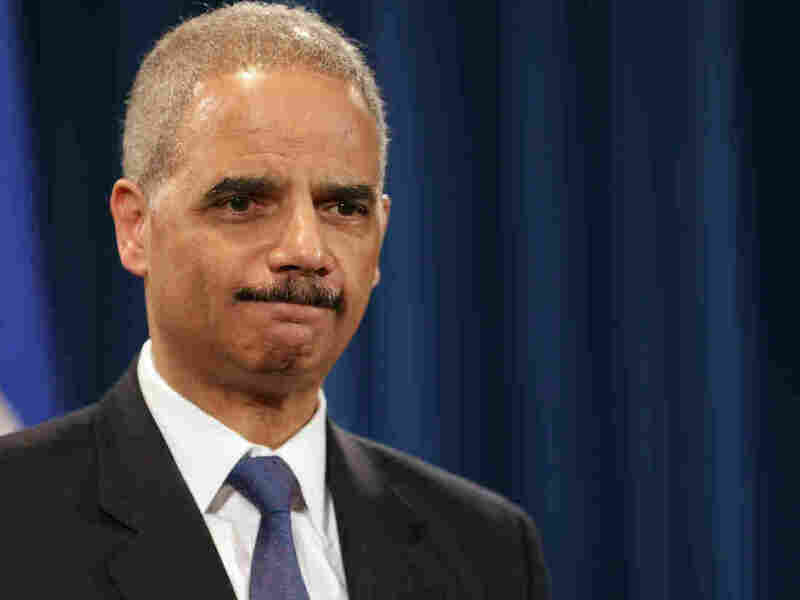 Holder Isn't Sure How Often Reporters' Records Are Seized : The Two-Way While looking for the source of a leak, federal investigators obtained phone records of Associated Press reporters and editors. There's been bipartisan outrage over what many see as government overreach. The attorney general tells NPR "I'm not sure" how many such seizures he's signed off on. Attorney General Eric Holder during a news conference Tuesday in Washington, D.C.
As his Justice Department faces bipartisan outrage for searching phone records of Associated Press reporters and editors, Attorney Gen. Eric Holder says he is not sure how many times such information has been seized by government investigators in the four years he's led Justice. During an interview with NPR's Carrie Johnson on Tuesday, Holder was asked how often his department has obtained such records of journalists' work. "I'm not sure how many of those cases ... I have actually signed off on," Holder said. "I take them very seriously. I know that I have refused to sign a few [and] pushed a few back for modifications." On Morning Edition, Carrie added that Holder declined to say whether there will be a review of the Justice Department's policy on searches of reporters' records. -- "Immediately return the telephone toll records obtained and destroy all copies, as requested by The Associated Press." -- "Announce whether it has served any other pending news media-related subpoenas that have not yet been disclosed." He will be asked about the search of the reporters' phone logs at a House Judiciary Committee hearing Wednesday afternoon. Committee Chairman Bob Goodlatte, R-Va., says, "Congress and the American people expect answers and accountability." Holder will also be questioned about the Justice Department's plan to investigate whether IRS personnel broke any laws when they gave extra scrutiny to some conservative groups' applications for tax-exempt status. -- Goodbye, Again, To Obama's Most Audacious Hope. -- Controversies Risk Starving Obama's Agenda Of Air. As the hearing gets underway, "the leaders of the House Judiciary Committee are expressing serious concerns about the Justice Department's gathering of phone records at The Associated Press," the wire service reports. "Republican Rep. Bob Goodlatte told Attorney General Eric Holder at a hearing Wednesday that he worries about any infringement on freedom of the press. Democratic Rep. John Conyers said he was troubled by the notion of the government pursuing a broad array of phone records."